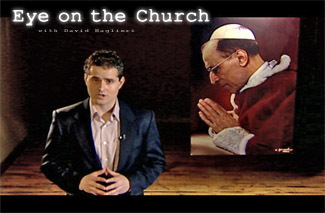 Salt + Light Television, creator and host David Naglieri focuses his eye on a series of contemporary issues which reveal Catholic individuals or groups who impact the world with their faith and whose stories are oftentimes misunderstood. From the controversy over Pius XII and the Holocaust to the current battles over Catholic Education, Eye on the Church is investigative journalism with a redemptive message. There is a lot of confusion regarding the duty of Catholic politicians in today’s age of relativism. Liberalizing laws on abortion and homosexuality have served to waken up a new sense of vocation and responsibility among young catholic Politicians. Features interviews with Canadian MP Jason Kenney, US Congressman Paul Ryan as well as George Weigel, Archbishop Marcel Gervais, Alan Keyes and more! This program is also an insightful look into the legacy of John Paul on Catholic political life. In September 2006 Pope Benedict addressed the topic of Islam and violence in a public address. His comments caused a firestorm of violence and anger in the Muslim world. What are Pope Benedict’s thoughts on Islam and how can the Church face the issue of Islamic based violence. This is a crucial issue facing the Church in the 21st century. Features interviews with Vatican Affairs Expert John Allen and Michael Coren. One of the most persistent controversies facing the Catholic Church in the decades after World War II is the alleged silence of Pope Pius XII during the Nazi Holocaust. As the Vatican moves closer towards the planned Beatification of the wartime Pope “Eye on the Church” investigates the claims against Pope Eugenio Pacelli. Features an exclusive interview with Sr. Margherita Marchione, the author of numerous books defending Pope Pius, and historian Dr. Robert Ventresca. With the fall of Saigon to communist forces in 1975 millions of Vietnamese citizens decided to flee their country rather than face life under a communist regime. Of the 2 million “Boat People” that fled half never made it. Hundreds of thousands were lost at sea or became victims of marauding pirates. In this issue of “Eye on the Church” David Naglieri speaks to many Vietnamese Catholic Canadians who share how the gospel virtues of faith and hope lay the foundations for their survival. With the debate raging across Canada about the necessity and value of Catholic education, “Eye on the Church” profiles a group of dedicated parents who worked with the Jesuit Province in Newfoundland to resurrect Catholic Education after its elimination through a public referendum.